I was 9 years old in 1995. I grew up in the first age of youth that began to make mix cds rather than mix tapes. I was of the first generation to see the MP3 and digitally available music become mainstream and readily accessible. I don't even own a cassette player anymore and I sold every single one of my cds over the 2009 holiday break. Music is as enjoyable to me in 2010 as it was in 1995, though the way I take it in is so different. To top things off, the first time I heard Amel Larrieux was in 1995, a little song by Groove Theory called "Tell Me"
In high school I wrote a 5-page "personal" essay reflecting on my past in which I would scour my family's cds and cassettes and make mixtapes. I described the amount of time at the ages of 8, 9 and 10 that I would spend listening to popular radio stations in Portland, Oregon, waiting for the precise song to play so that I could record it onto tape at the right place. The primary inspiration for this essay and a large chunk of it consisted of me discussing my obsession to "Tell Me." I can't say that it was the first song I fell in love with, but it is definitely possible that the song was my first true, conscious musical obsession. I didn't listen to the entire Groove Theory album until 2005, I hadn't listened to any of Amel's solo albums until 2004. I didn't even connect her to being the singer of what may have been the primary song of my youth. I still can't really explain why I love that song. It's simple in structure, chorus and production. Amel's vocals are wonderful, but hardly hold a candle to the things found on her later solo efforts. 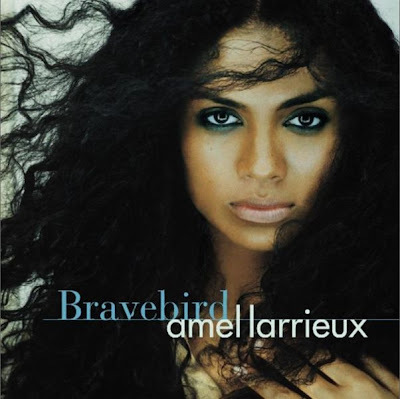 "Bravebird", her second solo album, released in 2004 isn't my favorite work of hers, but the fact is that it is an Amel Larrieux album, and it's still very good. The album shifts between jazzy numbers, more upbeat-almost Alicia Keys in 2007 style numbers, more traditionaly grrl-centric Neo-Soul, a song with a distinct Bossa Nova feeling, and a couple of tracks harkening back to the Acid Jazz styles of Groove Theory. Throughout the whole album, the production feels like ?uestlove and The Roots, the haze just barely hanging there. Amel's voice sticks out though, as it should. There is no doubt in my mind that Amel is one of the most gifted singers we have right now, with the ability to cover all the above-mentioned genres and still sound entirely herself. A more poppy Sade, a less menacingly pleading Mary J. Blige. If Erykah Badu wasn't already near perfect, Amel would hopefully be THE voice of the neo-soul movement. The album isn't perfect and I won't pretend that it is. Some lyrics are ill-fitting, some messages are to heart-on-sleeve. Amel is trying to spread hope through her words and that works for some people, it would've worked on a younger me, maybe it'll work on you. Regardless, it's an album you should listen to. She's a musician you should love. Um, I too was obsessed with this song. Remember how when we were little z100 had a version that played in their promos that said, "z100 I love youuuuu"?